Jolie and Brad Pitt, and her older brother James Haven were at the hospital at the time of her death. 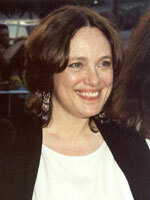 Marcheline Bertrand was an American actress of French-Canadian and Indigenous Iroquois and Québécois descent. She was born in Chicago, Illinois and married actor Jon Voight in 1971.However they divorced in 1978 after 2 years separation. This entry was posted on Tuesday, January 30th, 2007 at 10:28 pm	and is filed under Celebrity News. You can leave a response, or trackback from your own site. One Response to "Angelina Jolie’s mother died of cancer"